When he wakes up in the morning, all Jack wants is for someone to open his can of dog food and feed him breakfast. The cat gets her meal; the family eats their cereal. Who will remember to feed Jack? Jack is only playing when he knocks down the boys' tower of blocks over and over again. And he's the one to get the blame when the prize piece of the tower is missing. Wait until the boys discover who the thief really is! When Jack sees the tea party, he decides to join. He wants a snack. Just one...well, maybe more than one! This compelling, easy-to-follow wordless picturebook introduces preliterate children to elements of story, such as characters, setting, and action, enabling them to better understand language when they begin to read words. The Night Visitors arrive for a visit. They unhook Jack's leash so he can play with them. And when it's time to return to their ship, the Night Visitors want Jack to come with them! an imprint of Boyds Mill Press. Pat relied exclusively on visual techniques to create compelling pictorial narratives; there are no words in the books. Each one uses visual patterns and sequences to tell a short, charming and funny story. These books will be endlessly useful for encouraging careful observation, language development, sequencing, plot development, and ultimately, a love of books and reading. Boyds Mills, Feb. 2010. RTE $13.95. ISBN 978-1-59078-652-9. Jack Wants a Snack has been selected for the 2009 Texas 2x2 Reading List by the Texas Library Association. Best Children's Books of the Year, Bank Street College of Education. Audiences familiar with any of the three wordless books about Jack the dog will recognize his young owner in the background of this entry's first spread. But here the focus is on the boy's younger sister and her efforts to keep Jack away from her backyard tea party. It's not a fancy affair…the table is a cardboard box and all she's serving is popcorn...but Jack is decidedly not welcome. The girl does give Jack one piece of popcorn before huffily turning her back on him to feed her guests...dolls, stuffed animals, and a caped action figure. In single- and double-page spreads, the action-filled pictures keep pre-readers intrigued and on their toes by switching perspectives and zooming in and out (allowing young viewers glimpses of a curious chipmunk). Three horizontal pictures on one page show girl and dog joining forces, chasing the popcorn-stealing chipmunk from one end of a woodpile to the other. Kids will laugh when the girl's quickly fashioned trap (box, stick, string) catches Jack and not the chipmunk thief, now busily helping itself to the abandoned bag of popcorn. Just right for "reading" together and for listening to preschoolers tell the story on their own; be sure to have kids compare the almost-identical front and back endpapers, whose small differences sum up the entire satisfying tale. j.m.b. 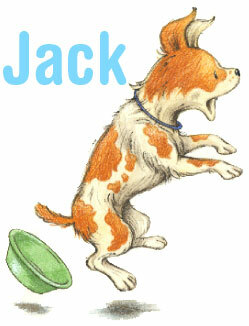 With these two wordless stories, Schories (He's Your Dog) introduces Jack, an eager red-spotted terrier. Like all good comic dog heroes, Jack is much beloved but also mildly hapless and misunderstood...which only serves to make him more winning. In Breakfast for Jack, the household is caught up in a typical weekday morning rush, and so the poor dog inadvertently gets none. Schories beautifully conveys Jack's bewilderment at his neglect: one pages shows Jack going back and forth between his empty bowl and the cat's full one. But not to worry...a red-headed boy of six or so, finally remembers to feed the pooch in the nick of time. Jack and the Missing Piece finds the canine hero banished and sulking after pestering the boy and a friend during a session of building blocks play. When the toy used to crown the boys' structure goes missing, Jack seems to possess both motive and opportunity. But some dogged detective work on Jack's part reveals the real culprit: the cat! The cozy familiarity of the plots, the sweet-natured hero and Schories's expert comic pacing of the vignettes (thanks to a skillful combination of spot drawings and full page renderings) adds up to plenty of fun and lots of openings for youngsters to add their own narration, dialogue, and woofs. Ages 2-6. Breakfast for Jack. ISBN 1-932425-16-0. LC 2004046916. Jack and the Missing Piece. ISBN 1-932425-17-9. LC 2004046954.
ea vol: illus. by author. unpaged. CIP. Front St. 2004. Tr $13.95. PreS-Gr 2-These wordless books chronicle ordinary events in the life of an engaging orange-and-white terrier. Wordless picture books are one of these truly great teaching aids we forget about in today's text-heavy electronic world, yet we know of nothing better to encourage a sense of story in a child than these books. There are clear beginnings, middles and ends in wordless books. They illustrate character, setting and action with little chance for misinterpretation. They're a great equalizer in those first days when children who have mastered the rudiments of reading seem to shine at the expense of the struggling reader or the child who has been exposed little to books. Pat Schories is a master at creating wordless books. Breakfast for Jack is a super, single-situation book that's accessible for most children. It's the story of a family who feeds themselves, feeds their cat... and forgets breakfast for their dog, Jack. This is doubly surprising as the cover art depicts Jack sleeping on the bed with his young master. It's a wonderful discussion starter about responsibility. The art is just perfect; there's no mistaking what's going on in every frame so retelling the story is not a problem for kids. Ms. Schories has also "written" two other wordless books about Jack and his adventures. Check the Front Street website for more information. The Jack books are $13.95 at your local bookstore and are suggested for ages three to eight. As with all good books, there are many more things that can be done with them at other than suggested ages. ...this charming little wordless book is sure to make dog lovers of all ages smile. The dog's obvious puzzlement and confusion, not to mention loss of heart is both funny and touching. Fans of the "Biscuit" books will recognize the artwork from those stories. In their third wordless book (Breakfast for Jack and Jack and the Missing Piece, rev. 1/05), a boy and his dog Jack meet some friendly space aliens one night. From their bedroom window, Jack and the boy watch as a tiny spaceship lands on the roof and a dozen small aliens pile out, waving congenially. After playing with the boy's toy trucks and cars, they request a snack, then munch away on cornflakes, one alien even perched on the boy's knee. Panic ensues when, unable to resist the little guy's charm, the boy captures the alien in a jar. The rest race to their ship and are quickly joined by their friend, freed when Jack lifts the lid in pursuit of a leftover cornflake. Despite his loss, the boy smiles at Jack as they watch the aliens fly off. Boy and dog, with their matching freckles, facial expressions, and orange hair/fur, are plenty appealing, but the exuberant aliens steal the show with their goofy antics and appearance (picture mini-tinmen with luminous Christmas-bulb eyes, noses, and antennae). The humorous details in the art (the spaceship looks like a VW bug without tires), the story's brief suspense, and the book's small trim size make this exactly right for pre-readers to "read" to an adult or enjoy on their own. J.M.B.